Frontispiece: The Flaming Carrot and all four Ninja Turtles rush into battle on a rooftop, charging down a faceless foe. 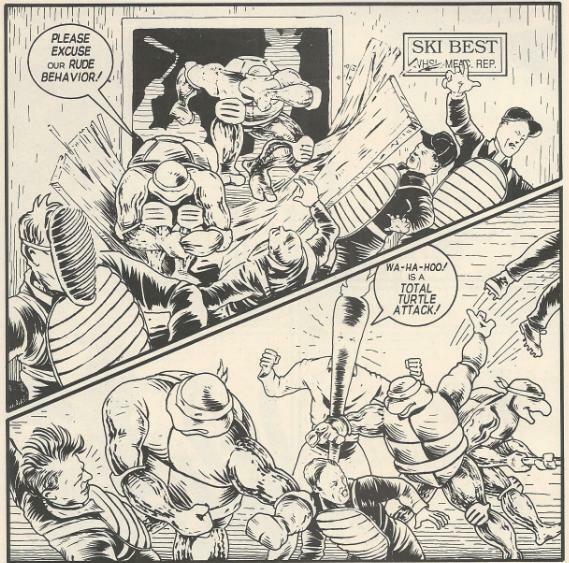 In the alleys, the Turtles remind the “Dark Avenger” that he’s Raphael. 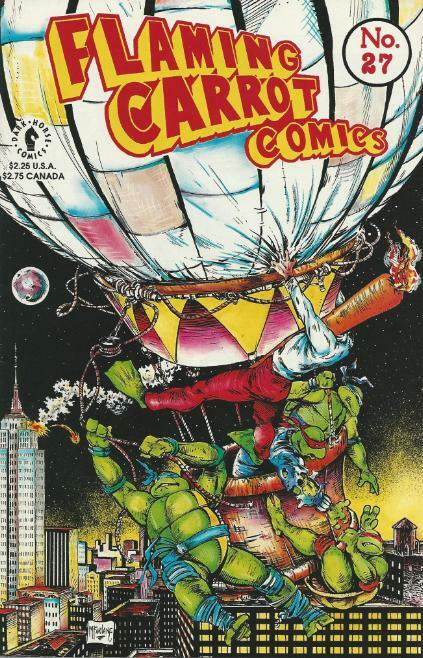 But even with his memory back, Raph knows he still has to help Flaming Carrot defeat the Fearless Umpires, so all four Turtles race to the Empire State Building. Upon arriving, they find the Umpires trying to attach rockets to the corners so they can steal the whole building. Flaming Carrot invites them in through a window. He’s defeated the Umpires that were interrogating him, but more are on the way. They take those Umpires out, then start throwing office equipment out the window and onto the rockets. A lucky shot activates one early, sending it flying and making it impossible for Robert Babo (the ringleader) to steal the building with only three rockets. Not happy, Babo tells his henchmen to prepare his hot air balloon for a potential escape. The Turtles and Carrot make their way to the roof, taking down more Umpires along the way. Finding a command center, Carrot sends a message to the Mysterymen to come help. The message is picked up by Screwball and Mystic Hand, who are still out driving. Because Screwball doesn’t understand how a vehicle works, he accidentally activates the passenger ejector seat without first opening the sun roof. Mystic Hand is knocked unconscious by the bump on the head and has to be taken to the hospital, leaving Screwball to head to the Empire State Building alone. Using his nuclear powered pogo stick, Carrot takes down some more Umpires. He interrogates one, who informs him of Babo’s escape balloon. As Carrot and the Turtles continue on their way to the roof, Screwball arrives and drives his car straight through the door and up the stairs. On the roof, Babo is resorting to plan B. He asks Frankenstein’s Head to use his magical abilities to levitate the roof. Meanwhile, his Umpires are keeping the police and the Mysterymen on the ground at bay by throwing pennies at them from the roof (and killing several people). The Turtles and Carrot arrive and start wrecking Umpires until Babo unleashes his Barbecue Ray. One zap from it and the heroes will smell like barbecue sauce forever. Before he can fire, Screwball bursts through in his car and mows down the ray. In the confusion, Raphael snatches Frankenstein’s Head and the Turtles play a game of keep away with it. Finally, Carrot tosses it to Screwball and tells him to fly away with the noggin on his rocket boots before he can levitate the building. Frankenstein’s Head mentally attacks Screwball with thought power and Screwball responds with his own mental attacks. The two are locked in telepathic battle until Screwball’s pet shoelace crawls inside Frankenstein’s Head’s ear and tickles him. The momentary lapse of concentration hands Screwball the victory and he flies off with him. In the scuffle, several spare fuel tanks for the hot air balloon are ruptured and about to blow. 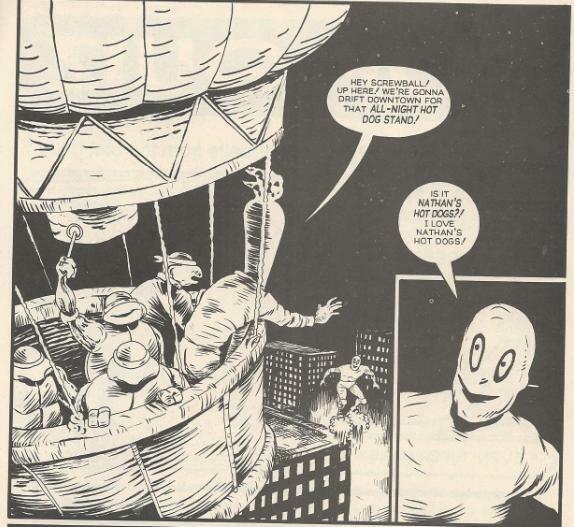 Carrot and the Turtles escape on the balloon before the tanks left on the roof explode, killing Babo and his Fearless Umpires. Meanwhile, Frankenstein’s Head recites a spell and vanishes from Screwball’s hands. Undeterred, the Turtles, Flaming Carrot and Screwball decide to go get some Nathan’s hotdogs. Elsewhere, Frankenstein’s Head’s spell, intended to give him the body of vicious Viking Rudolf the Remorseful, failed. Frankenstein’s Head is now stuck with the body of Rudolf the Red-Nosed Reindeer. *This story is continued from Flaming Carrot Comics (Vol.1) #26. *The Turtles will meet the Flaming Carrot again in TMNT/Flaming Carrot #1. *I put the publication date for this issue as Late Summer/Early Fall, 1991 because, for the life of me, I cannot find an indicia anywhere in this issue with publication information in it. So I don’t know exactly what month this issue was released. All I have to go by is that last issue was published in June and releases typically skip a month when they aren’t running late. *This issue also included a “What is this Flaming Carrot?” strip by Burden, and a Flaming Carrot Pop Quiz. And the first crossover between the Ninja Turtles and the Flaming Carrot comes to an end. Honestly, I think my biggest grievance with this story isn’t that I found it unfunny, as humor is subjective and all that. It’s more that Burden didn’t seem to understand the Turtles or their personalities and makes no attempt at distinguishing between any of them. 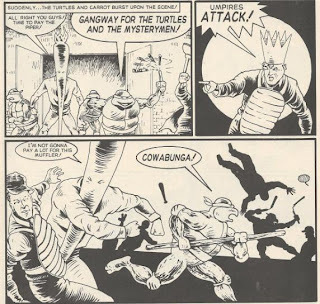 There’s nothing distinct about how any of the Turtles act; they spew all the same vacuous non sequiturs as every other character in the comic and their identities are entirely interchangeable (and by "identities", I mean a "cowabunga" here and a "radical" there). 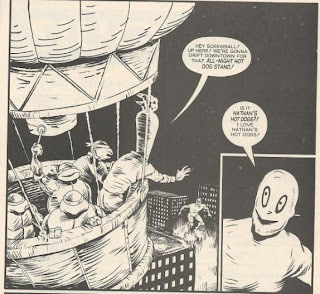 In that regard, the whole idea of the “crossover” seemed entirely needless, as why would Burden even bother if he wasn’t going to make an effort to write the Turtles AS the Turtles? They could have been any other generic Mysteryman and it would have changed nothing. I guess Burden just wanted the guaranteed sales boost that would accompany having a Teenage Mutant Ninja Turtle on the cover of your comic in 1991, but didn't feel up to putting forth the effort to write them in-character. As far as other elements of the story go, we never found out what the deal with the Vague Dudes and their extendable eyes and amnesia ray was. I guess they played a part in later Turtle-free stories, but for those of us only tuning in for the crossover, it’s sort of a dangling irritant. The cover by Todd McFarlane sort of took me by surprise, as I’d never have guessed it was him had I not noticed his unmistakable signature in the corner. I wonder if it was redrawn in any way, or if he was making a point to draw the Turtles in Burden’s style as opposed to his own. It’s a pretty good cover, either way, and probably my favorite thing about this whole issue. As I said when I began, Flaming Carrot just isn’t for me. There’s still the 4-issue crossover miniseries from Mirage that I’ll have to get through, but maybe I’ll enjoy that one a bit more. I’ll tackle that sometime later.